The following list of HQS items is checked at the time of an inspection. The dwelling unit must include sanitary facilities within the unit. The facilities must have hot and cold running water and must be properly trapped and vented. The facilities must utilize an approved public or private disposal system, including a locally approved septic system. The dwelling unit must have suitable space and equipment to store, prepare and serve food in a sanitary manner. All required equipment must be in proper operating condition. According to the lease, equipment may be supplied by either the owner or the family. The kitchen sink must have hot and cold running water and drain into an approved public or private system. Waste and refuse storage facilities are determined by local practice and may include trash cans or dumpster facilities. The dwelling unit must provide adequate space and security for the family. Window and door surfaces (including the frames) must be in sufficient condition to support the installation and proper operation of the windows and doors and their locking mechanism. See chart for space requirements. Note: It is recommended to check with the municipality where the subject property is located regarding their requirements. The dwelling unit must be able to provide thermal environment that is healthy for the human body. The heating and/or air conditioning system must be in proper operating condition. All gas fired systems must be properly vented. Working cooling systems are not required by HQS, but if present must be operating safely so not to create a potential fire hazard or other threat to health and safety. Each room must have adequate natural or artificial illumination to permit normal indoor activities and to support the health and safety of the occupants. The dwelling unit must have sufficient electrical sources so occupants can use essential electrical appliances. Electrical outlets and switches must be properly installed and maintained. There must be at least one operable window in both the living room and each sleeping room. The dwelling unit must be structurally sound and protect the occupants, using proper maintenance and construction practices. The unit must be weather-proofed and guard against vermin infiltration. Handrails are required when four or more steps (risers) are present, and protective railings are required when porches, balconies and stoops are thirty inches above grade. The dwelling unit must be free of air pollutant levels that threaten the occupants’ health. Windows designed to open must not be painted or nailed shut. The ventilation fan in the bathroom must operate as intended. The dwelling unit must be served by an approved public or private water supply that is sanitary and free from contamination. All water heaters must be free of leaks, have a pressure relief valve and a properly installed discharge line. Fuel burning equipment must have the proper clearance from combustible materials and be properly vented. The Lead-Based Paint Poisoning Prevention Act as amended (42 U.S.C. 4821 – 4846) and the Residential Lead-Based Paint Hazard Reduction Act of 1992 and implementing regulations 24 CFR Part 35 Subparts A,B,M, and R apply to the housing choice voucher program. The building must provide an alternate means of exit in case of a fire. The site and neighborhood must be reasonably free from disturbing noises and reverberations or other danger to the health, safety and general welfare of the occupants. The dwelling unit, its equipment, elements and components must be in sanitary condition. The unit must be free of vermin and rodent infestation. There must be a detector on each level of the dwelling unit including basements. Additional detectors may be needed based on the floor plan layout of the dwelling unit. The following list of basic items is checked at the time of an inspection. Surfaces must be properly installed, structurally sound, weather resistant and rodent proof. Sidewalk, steps and driveways should be properly maintained and free of hazards. Handrails and guardrails will also be inspected. Yard areas and fence/gates will be checked for proper maintenance and hazards. Windows and doors must operate properly and have the proper functioning locks. Interior surfaces and trim must be properly installed and maintained. Floors, walls and ceiling should be structural sound. Unit should be clean and clutter free. All fixtures must be clean and functioning properly. The fixtures will be checked for proper water pressure and proper drainage to an approved public sewer system. Fixtures will be checked for hot and cold running water. The plumbing system will be checked for proper maintenance and installation. 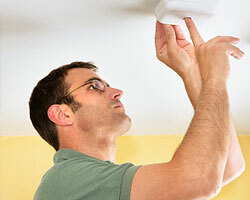 All electrical equipment, wiring and appliances will be checked for proper installation. Outlets and switches will be checked to make sure they function properly. Every habitable space in a dwelling shall contain at least two separate and remote outlets. Every laundry area shall contain at least one grounded type outlet. Every bathroom shall contain at least one grounded outlet. Service entrance lines will be checked for proper height, clearance and installation. Electrical service panels will be checked for proper fuse/breaker size and proper number of circuits. Every dwelling shall be served by a main service which is not less than 60 amperes. Every public hall, interior stairway, bathroom, laundry room and furnace room shall contain at least one electrical light fixture.